For decades, the utilities industry has been a driving engine of the US economy, contributing to our progress with a business model that focuses on centralized generation. But now, power companies face a crisis that requires them to capture a new market share to survive in the 21st century. From substations to gas stations, boardrooms to military bases, this film tells the story of America’s energy industry on the brink of massive change. Whether it fails, prevails or adapts, the outcome will profoundly affect us all. In 1991, Georgia underwent a paradigm shift in how we do energy planning. The IRP--a comprehensive energy plan written by GA Power, and approved by the GA PSC--determines what plants are closed or built, how much energy efficiency is funded, and how much solar we do via the power company. The legislator who sponsored that bill in 1991 will join me to share that bit of unknown history on Wednesday, March 27th at the NCR World Headquarters (a dual LEED Platinum building) from 10am to 11:30am. The event will be held at 862 Spring Street (NCR) on ground level (behind the coffee show) in the Tech Talk indoor amphitheater. Park in the visitors parking area (free) or on the street (credit card required), or take Marta to the Midtown Station and come south several blocks. 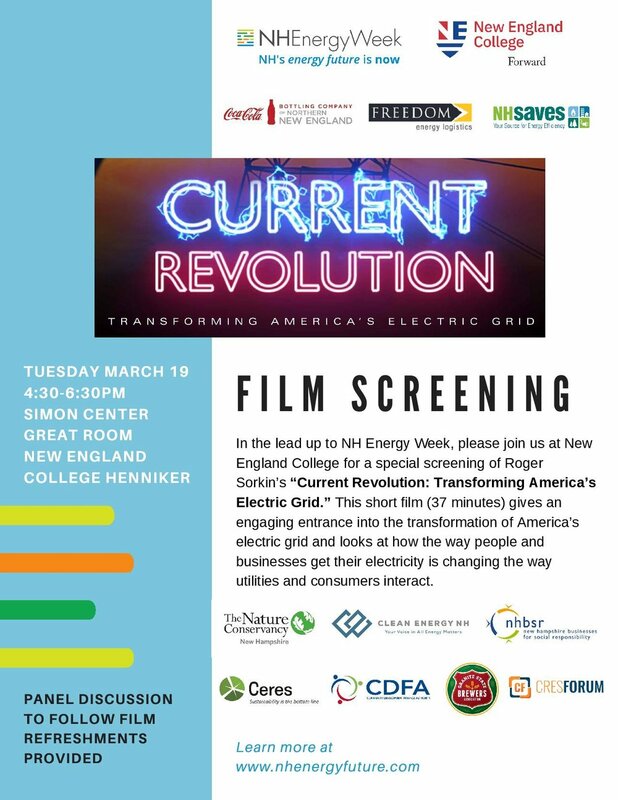 Following the screening of “Current Revolution” there will be a post-screening discussion featuring Roger Sorkin (director), Leilani Munter (Film Subject, Race Car Driver, and Environmental Activist), and John Kliem (Film Subject, Executive Director of the US Navy’s Resilient Energy Program’s Office). ARP Director, Roger Sorkin, has been invited to join a panel during the 8th annual Climate Leadership Conference in Baltimore, Maryland. The conference brings together professionals with backgrounds in climate, energy, and sustainability to discuss topics such as future policy or business initiatives. Free admission for this screening sponsored by Western Mass Green Consortium and Prosperity Candle. This event is co-sponsored by the Grand Canyon Chapter Sierra Club, Clean Energy for a Healthy Arizona campaign, and Southwest Energy Efficiency Project. This screening is held by ASU Tempe Campus. Primarily for students and faculty, ASU has opened the screening to the public. The event has been co-sponsored by ASU Global Institute of Sustainability, ASU Lightworks, AZ Sustainability Alliance, and Green Living magazine. This screening of our film, Current Revolution, is co-sponsered by the Grand Canyon Chapter Sierra Club, Clean Energy for a Healthy Arizona campaign, and Southwest Energy Efficiency Project. The Vermont Law School will host a panel discussion starting at 1:00 pm followed with clips of the film. The screening and discussion is free, but registration is required for this event. Please visit https://www.surveymonkey.com/r/TidewaterEvent to register. From substations to gas stations, boardrooms to military bases -- this film tells the story of America’s energy industry on the brink of massive change. Whether it fails, prevails or adapts, the outcome will profoundly affect us all. This is the first in a series of new films about the future of the U.S. energy grid from American Resilience Project, producers of Green Film Fest 2017 award-winner Tidewater.